Harding Nana was named the top senior male athlete for 2005-06. 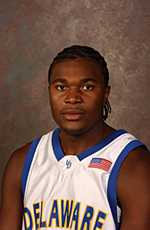 10:35 a.m., May 17, 2006--Harding Nana, a two-time All-Colonial Athletic Association forward who ranked among the NCAA leaders in both scoring and rebounding the last two seasons, has been named the University of Delaware's outstanding senior male athlete for 2005-06. Nana was honored during the annual men's intercollegiate athletics awards luncheon held Tuesday at the Bob Carpenter Center. Nana also was the winner of the Col. C.B. Shaffer Award as the basketball team's most valuable player. Nana, a 6-foot, 8-inch forward, is a native of Douala, Cameroon. He attended Virginia Tech before transferring to UD, where he played three productive seasons and now is hoping to earn a tryout with a National Basketball Association team. The leadership major is the first basketball player to earn the prestigious outstanding senior male athlete award, which is determined by a vote of the head coaches of the 11 varsity sports, since Mike Pegues in 1999-2000. Nana is just the fourth player in UD history to score more than 1,300 points and collect 700 rebounds. In 2005-06, he scored 19 points per game and had 10.9 rebounds per game, with the latter tops in the CAA and ninth in NCAA Division I. In addition to Nana, the following scholar-athletes were honored as the outstanding performers on their teams, as selected by team members. Baseball: Senior shortstop Todd Davison won the Papp Lukk Award as the UD Alumni Association most valuable player. A four-year starter, he has set new school records for career games played, consecutive games played, consecutive starts, at bats and assists. The team co-captain, who is majoring in communication, is a career .305 hitter. Cross country: Junior P.J. Meany, a business major, earned the UD Alumni Association most valuable competitor award for the second straight year. Meany was the top finisher in all seven races and has led the team in 13 of the last 14 races dating back to the 2004 season. He finished eighth at the Colonial Athletic Association championships and 12th at the NCAA regional meet. Also, senior cross country and distance runner Kevin DuPrey was the recipient of the Eastern College Athletic Conference (ECAC) Medal of Merit presented to the senior male scholar-athlete letter winner with the highest grade point average. A 2005 team captain and a member of the UD Athletics Governing Board, DuPrey carries a 3.88 grade point average as a biological sciences major and will attend the Philadelphia College of Osteopathic Medicine. Football: Senior quarterback and co-captain Sonny Riccio was named the UD Alumni Association most valuable player. A two-year starter, Riccio enjoyed a record-setting career in leading the Blue Hens to a two-year mark of 15-9. Among the school records he established were pass completions in a game (33) and season (259), and career yards passing per game (190.4). He is a sport management major. Also, senior Brett Wharton received the Outstanding Contributor Award presented by UD Student Services for Athletes. A biological sciences pre-med major, Wharton was active as a peer mentor, with the Student-Athletic Advisory Council, and in Hurricane Katrina relief efforts. Golf: Junior Joe McLister was the winner of the John J. DeLuca/Scotty Duncan UD Alumni Association most valuable player award for the third straight year. A two-year captain, McLister finished 10th at the CAA championships, was named first team All-CAA and led the Hens to their best ever finish at the CAA championships. He is a business major. (4:07.43), and earned All-East honors when he placed second in the mile at the Intercollegiate Association of Amateur Athletes of America (IC4A) championships. Lacrosse: Junior attack Cam Howard earned the UD Alumni Association most valuable player award. A three-year starter, Howard led the Hens to their second straight CAA tournament. In 2006, he recorded team highs in assists (27), points (56) and shots on goal (106), and ranked second in goals (29). He has earned All-CAA honors three times, earning first-team honors in both 2005 and 2006. He is a plant science major. Also, senior Bob Meunier was the winner of the Dr. Janice Jordan Award presented by UD Student Services for Athletes to a scholar-athlete who has made outstanding progress academically. A geography major, Meunier serves as a peer mentor for Student Services for Athletes. Outdoor track and field: Junior Jared Wasser received the UD Alumni Association most valuable athlete award. Wasser was a standout in the weight events for the Hens, finishing third in the shot put and 10th in the hammer throw at the CAA championships and earning All-East honors with a seventh place finish at the IC4A championships. He is a physical education major. Also, junior hurdler Chris Dixon, an electrical and computer engineering major and honor student, received the David A. Sharp Academic Award for outstanding academic success. Junior pole vaulter Matt Guida received the D. Kenneth Steers Award presented to a member of the team with outstanding academic success. A three-year letter winner, Guida is a finance major with a minor in economics. Soccer: Junior defender Anthony Talarico was selected the UD Alumni Association most valuable player. The two-year starter served as a tri-captain in 2005, when he led the Hens in scoring with three goals and helped the defense post four shutouts. He is a mathematics major. Swimming and diving: Senior Levan Beridze earned the Jack and Hugh Dougherty UD Alumni Association award for the second straight year. Beridze has recorded a dozen top 10 finishes in the CAA championships and led the Hens to their best CAA team finish in 2006. He is a political science and international relations major with a minor in Russian. Also, sophomore Adam Blomberg earned Thomas Baranello Award for outstanding athletic and academic accomplishments. Blomberg, a College Sports Information Directors of America (CoSIDA) Academic All-American nominee, is a physics major with a minor in business management. Sophomore Adam Mullan received the Chuck Ganci Award as the team's most improved athlete. Tennis: Freshman Nolan Greenberg won the Alexander J. Taylor UD Alumni Association award. In his first collegiate season, Greenberg led all UD players in singles victories with a record of 13-7, including a mark of 5-5 at the No. 2 spot. He also recorded a doubles record of 12-8 with partners Philip Wayne (6-1) and Jesse Carl (6-7). He is a hotel, restaurant and institutional management major. Also, Jonathan Edwards was the winner of the Lee J. Hynick Award as the junior letter winner on the team with the highest grade point index. The UD athletics department also presented staff member Bill Wilson the ECAC Appreciation Award for overall contributions to the program. Wilson has been a part-time employee of the UD athletics department for the last five years, working with the football equipment room, game operations and ticket sales, and as an usher at the Bob Carpenter Center.